. 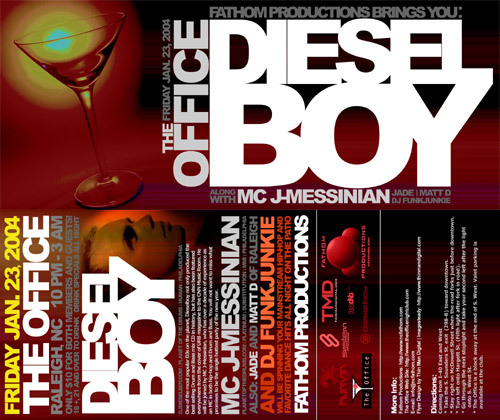 :: ncfathom.com - Dieselboy: Jan. 23, 2004 ::. Dieselboy (djdieselboy.com : planet of the drums : human : philadelphia): One of the most popular DJs on the planet, Dieselboy not only produced the best selling Drum and Bass mix CD in history, but has also been featured everywhere from the cover of URB magazine to the CNN Music Room. He will be joined by MC J-Messinian, who has over a decade of experience as an MC in both hip-hop and Drum and Bass. You will not want to miss what promises to be the single hottest party of the new year. 10 PM - 3 AM. * Coming from I-40 East and West, take the S. Saunders St. exit toward downtown. * Stay right on McDowell Street when the road forks just before downtown. * Go through the next stoplight and then take your second left after that light onto S. West Street.